Area roadways are slick in spots. 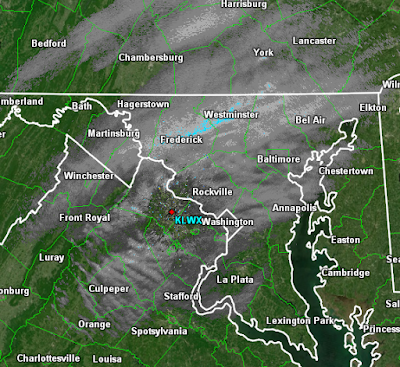 However, the back edge of the snow is now moving through Northern Virginia and parts of Maryland. The snow should end from west to east over the next few hours. Use caution on the roads as black ice may have formed due to melting/refreezing of moisture. The radar is beginning to really blossom around the area. A large portion of the area is reporting either light flurries or very light snow at this time. A Winter Weather Advisory is in effect until 7:00pm tonight. Due to cold conditions, slick spots will be possible on roadways during the afternoon and evening rush. Additionally, several area school systems are closing early. However, Montgomery Co Schools are closing according to REGULAR schedules. Radar shows snow developing across the area. The area of blue radar returns has the steadiest snow at the current time. Expect increasing coverage of the snow throughout the early afternoon. Light snow is expected to develop across the metro areas this afternoon. 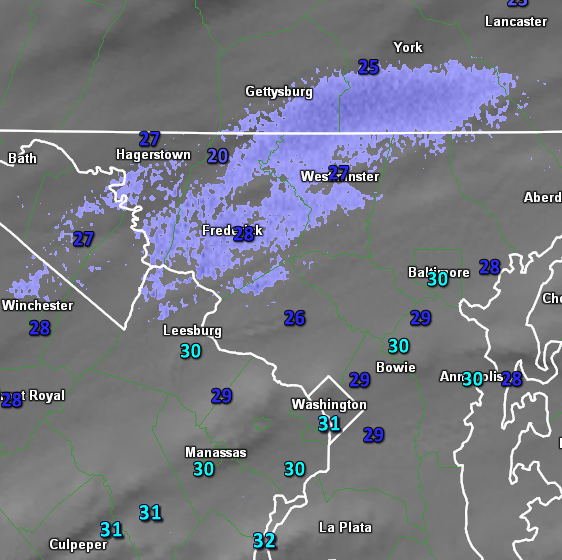 Flurries and very light snow are already being reported in northern parts of the area to as far south as Gaithersburg. While accumulations should be limited to mainly north and east of the Potomac River, an inch to two inches are certainly possible. Due to it being Friday, and the snowfall occurring during the afternoon, impacts to the evening commute are certainly possible. 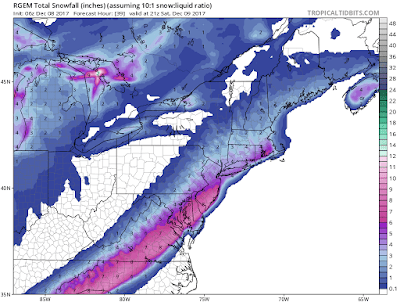 The highest accumulations will likely reside from Baltimore and to the north and east. But an inch or so of snow is possible as far south and west as the Potomac River. A coating may be possible in Northern Virginia. Be prepared for hazardous roadway conditions and give snow treatment vehicles plenty of room! Any additional updates will be posted as needed this afternoon and evening. For this reason, a Winter Weather Advisory is in effect until 7:00pm this evening! Howard County Schools have announced they are closing 90 minutes early. The radar around 10:45am. You can see snow beginning to develop to the north and west of the city centers. Well folks...I'll eat my words from yesterday. Yesterday morning I had posted that the chances of snow looked pretty slim and prospects were pretty muddy going forward. Well...yesterday, the models trended west with the system that is expected to slide off the east coast. For this reason, a more "significant" snowfall is seemingly likely. While this won't be an outright snowstorm, a light to moderate event is likely. One thing to note is that the cutoff will be quite sharp. In other words, you will not have to go far to go from 4 inches of snow to nothing. We'll get into the specifics below. As mentioned above, a coastal storm system will track off of the east coast later tonight and tomorrow. With the storm track now expected to be a little to the west of prior forecasts, snow will become likely very late tonight and throughout the day tomorrow. The upper level portions of this storm system have improved a lot over the past 24 hours. Snow will become likely by the wee hours of Saturday morning. The National Weather Service has issued a Winter Weather Advisory, which is in effect from tonight until 4:00pm Saturday afternoon. The purple areas are under a Winter Weather Advisory for this potential storm. This *may* be extended farther to the west with more model data arriving later this morning/this afternoon. Heavy snow is NOT expected. However, light to at times moderate snow will be likely. The best chance at a little more snow will be to the south and east of the metro areas (this much has not changed). What HAS changed is the expected western extent. Light snowfall may make it as far west as the Blue Ridge. There may also be some upslope farther west over the mountainous areas of the area. The 06z GFS model forecast for the storm. You can see the snow backs pretty far to the west on this model. Road accumulations should be minor due to temperatures hovering around or just above freezing - but slick conditions are still possible...especially given the low sun angle at this time of year. Total snow accumulations south and east of the area will be 2-4 inches in spots. 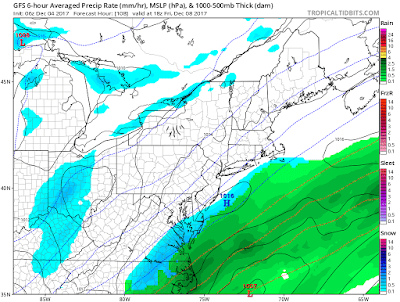 In the immediate I-95 corridor, 1 inch to as much as 3 inches may be possible. Farther west, the accumulations will taper down to an inch or less or a coating in the farthest west areas. 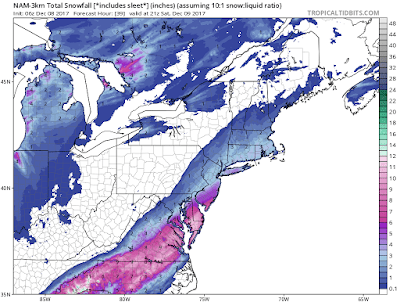 The 06z run of the 3km NAM model shows a bit more of an eastern snow profile. However, snow still gets into most areas...except for the far western zones. 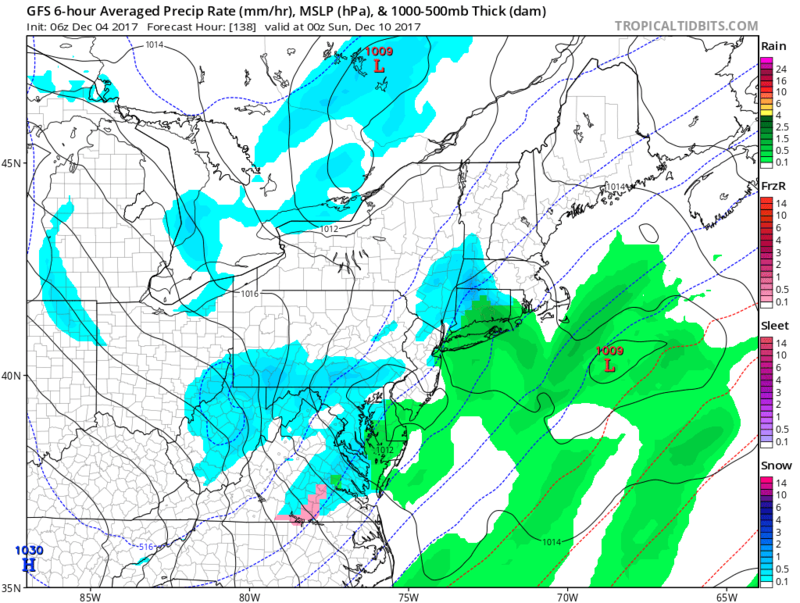 The RGEM (Canadian regional model) is showing a very robust solution. I'm not sure this will happen. What's the potential of this being a busted forecast? I would say that we are probably pretty close to the "maximum potential" for this snow event. It's a fairly quick hitting event, which prevents it from being a more significant event. There IS, however, the potential for the storm to cut east again, which would reduce totals significantly. SNow is notoriously hard to get in this area. Will post updates as we draw closer. Stay tuned! The model runs today have given a bit of a welcome surprise for snow lovers! They have come west a bit with the edge of the precipitation for the Friday night and Saturday morning snowfall. The cutoff will be sharp from east to west - but the potential now exists for an inch or two of snow around and to the east of the metro areas. Accumulation on roads would likely be very limited. A full update will be posted (with images tomorrow morning). As promised, the colder weather has arrived. Chilly conditions will persist into next week with high temperatures ranging from the upper 30s to the mid 40s. This cold shot was well predicted by the model guidance. The next topic of discussion is snow chances. While there will be a relatively weak system off the coast this weekend, the most it will do for our area is some scattered/isolated rain or snow showers. 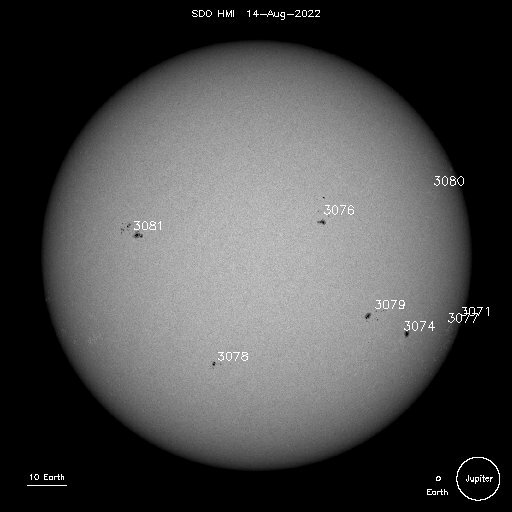 Further, most of this activity will be to the south and east of the metro areas. Snow lovers will have to continue waiting for something significant. The trend of the last few runs of the GFS model for this weekends coastal system. You can see it has shifted a bit west again - but the area remains on the fringe regardless. Any impacts should be minor. The middle and longer range models continue to show an trough over the eastern portion of the country. This translates to continued chilly temperatures. There are numerous pieces of energy in the flow that *could* produce some lighter snow events. However, prospects of bigger snowstorms seem relatively bleak for the next period. This is not to say that a rogue system couldn't pop up and deliver a 1-3 inch event. A loop of the 06z GEFS model run from this morning. This particular view shows the 500mb height anomaly. Blue colors indicate a negative anomaly while the red colors indicate a positive anomaly. This ensemble GFS model shows good chances at continued cool temperatures. This is the ECMWF ensemble (EPS). This is the Euro equivalent to the GEFS. You can see it is in good agreement of negative height anomalies in the eastern part of the country. Whether this translates to snow remains to be seen. Safe to say the 60 degree weather is gone for the time being, though. Many DC area snowstorms tend to come on the relaxation of the long wave pattern (as discussed in the last post). This could translate to a snowstorm threat down the line - but certainly not in the near range of the forecast. This period is a good example of the fact that cold weather does not always translate to increased snow chances. Often times what will happen is arctic air will flood so far south that storms become suppressed to the south and east (good example of what is happening this weekend). The TL;DR is that snow lovers will have to wait longer for the first shot at a good amount of snow. Conversational flakes still seem possible over the next week or so - not enough to close schools or workplaces, however. Colder temperatures are a lock to move in behind a cold front later tonight and tomorrow. Relatively elevated overnight temperatures tonight won't rise a ton tomorrow. While temperatures today will be into the 60s, temperatures tomorrow likely won't rise out of the 40s...although upper 40s do seem probable. By the second half of the week, highs in the lower to mid 40s become more likely. There may be highs in the 30s sprinkled in into the weekend and early next week. From Wednesday into next week, highs will generally oscillate in the upper 30s to mid 40s. While these temperatures aren't "frigid," they will feel noticeably colder than the past few weeks. Temperatures predicted by the 06z GFS model for early tomorrow afternoon. 40s should generally be the case throughout the area. Some blustery winds will also be possible (up to 30mph gusts at times). Unlike the cold temperatures...odds of snowfall are much more uncertain. If one looks at the past few GFS runs, the odds of anything more than light snow or flurries seem pretty low. However, uncertainty is pretty high with the pattern we are entering into. There will always be chances for light to moderate snow events to develop in the short to mid range. Snow events are notoriously difficult to predict far in advance (except in a few very rare cases like February 2010). There will be a weak coastal storm that may scrape extreme eastern portions of the region towards this weekend. The last few runs of the GFS have shown a bit of a trend west. Nonetheless, this won't be a significant precipitation producer by any means...odds of a few snow showers or rain showers are definitely there though. The last four runs of the GFS model. The coastal storm is still well to the east. It's unlikely to produce anything more than a few snow or rain showers. However, stay tuned. After this weekend, some odds do exist for clipper type systems to bring light snow accumulations to the area. However, these types of systems do not become apparent in the flow until short lead times. I'll continue to monitor and post updates if any more legitimate threats evolve. Despite cold temperatures, odds of anything *significant* snow seem low throughout the period. Of course, this is subject to change. 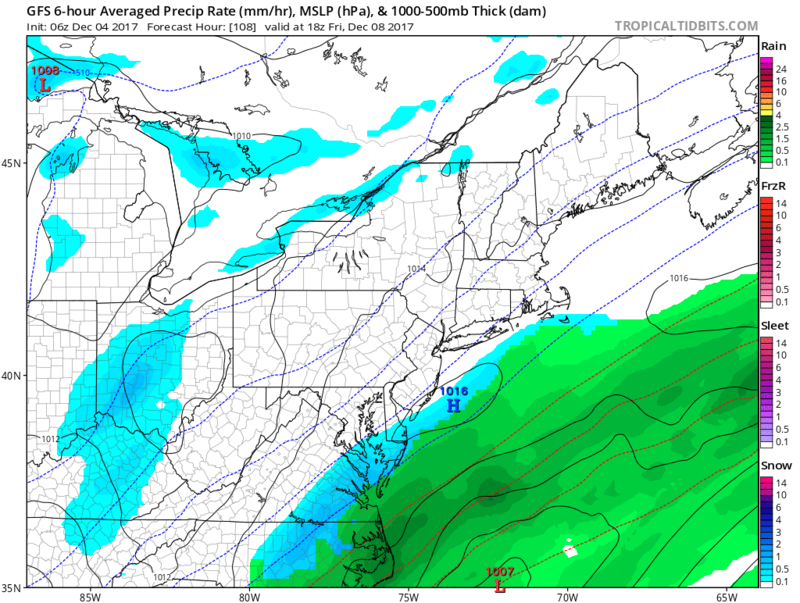 Take a look at the GFS model from start to finish...not a whole lot of precipitation to speak of. Cold and dry might be the rule for a while. The entire run (from now out to 384 hours) of the 06z GFS. This particular map style shows possible precipitation types. 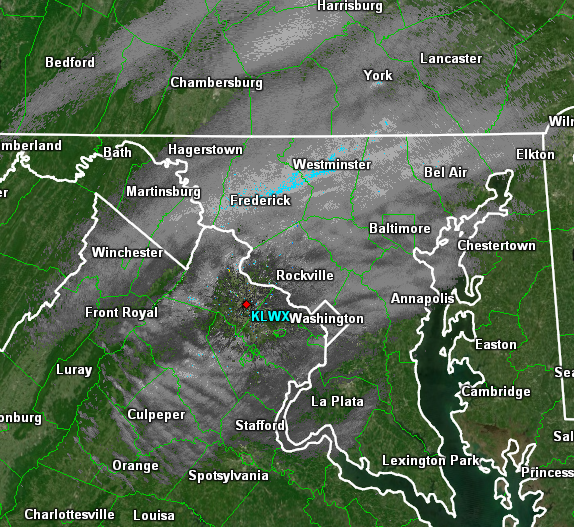 You can see that for the most part, the DC area misses out on anything falling from the sky. Subject to change. Snowstorm threats, however, do tend to be more likely as the pattern relaxes...so it is possible that a more substantial snowstorm threat may develop as we approach a relaxation of the long wave pattern later in December. Chilly Air Arrives This Week - Snow Too? The mild weather that has been with us for the past week or two is coming to an end. A strong cold front will be passing through the area later on Tuesday and into Wednesday. Temperatures on Wednesday may actually fall during the day. High temperatures will be in the 40s later in the week, and 30s for highs may arrive by the weekend or early next week. The big question I've been being asked lately is when the chances for snow will be arriving. I'll start to poke around that question below. Late this week and into this weekend, there will be a few shots at some snowflakes in the air. A weak coastal storm will develop well off the coast on Friday and may allow for some flurries to fly in the area. At this time, the forecast models predict that this will be too far east for much at all. The 06z GFS from December 4, 2017 showing a weak storm system well off the NC coastline. Notice that most of the area remains precipitation free on this frame. A potentially higher chance at snow showers comes into the weekend. Keep in mind, no models indicate a large snowstorm or anything more than a small amount of snow. But the odds are increasing at flakes in the air. Of course, I'll continue to monitor the latest information and model guidance to keep you posted on any changes in this forecast. For now, simply expect colder temperatures and a few small chances at some light wintry weather over the next week or so. 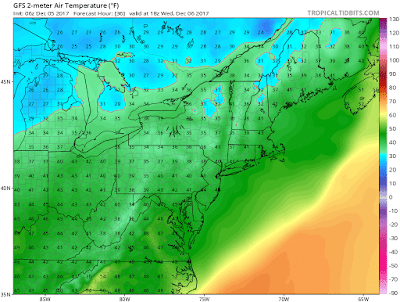 The 06z GFS from December 4, 2017 showing some snow showers around the area for Saturday night. Any of this activity would likely be light in nature. You are free to share content from The Capital Region Pulse as long as you credit us properly.. Simple theme. Powered by Blogger.